In this post, we take a look at the “Industrial Property Clock” for the same period, from the same report. In general, cities in Central Mexico and in the Bajío are well “ahead” of cities in northern Mexico on this clock. 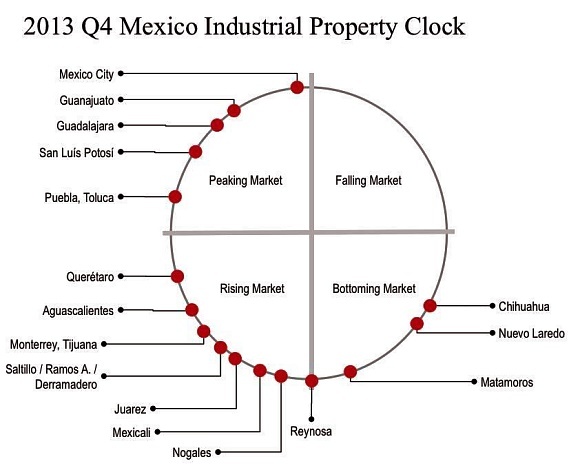 The analysis by Jones Lang LaSalle suggests that the commercial and industrial property markets in Mexico City, Guanajuato, Guadalajara, San Luis Potosí, Puebla and Toluca are “peaking”. The two remaining cities in the Bahío (Querétaro and Aguascalientes) are joined by several cities in northern Mexico in the “rising market” portion of the graph, while Reynosa, Matamoros, Nuevo Laredo and Chihuahua are anchored in the “bottoming market” portion. My name is Ruben L. Ruiz. I am a businessman who owns property just east of Agua Prieta, Sonora, Mexico. There are plans to make Agua Prieta a future hub of shipping to eastern and northern United States. Agua Prieta is on the border next to Douglas, AZ. U.S.A.
industrial complexes and more energy are all planed for the area. It will be a boon for the region. Much investment will be procured for the area. I own 10,000 acres just 8 miles from Agua Prieta. I was recently offered a business plan from a European company for sustainable energy. During negotiations the company went under. They were offering wind power to provide electricity to the area. Their plans were to offer electricity to both sides of the border. My real estate is perfect for wind or solar energy. Carretera dos (Highway 2) runs through the property and allows access to the demographics of need for energy for such a business process. I am in the initial process of finding a commercial real estate business or a energy company to take this opportunity. I have a partner who is my brother and we have a lawyer. Sonora has a less stringent law for an environmental impact study. This offers a fast track to making a business deal.